Villa 1210 is located within the Exclusive and Gated Community of Pristine Bay "a 405-acre Luxury Resort" Our Villa features 2 bedrooms 2 bathrooms with a private infinity pool and patio with spectacular views of the golf course, Caribbean Sea (Roatan’s north shore) and green hillsides. 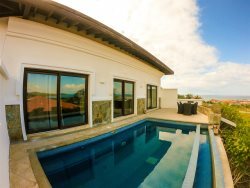 The villa is tastefully decorated, a fully equipped kitchen with stainless steel appliances, blender, Coffee maker, toaster, kitchen utensil, washer/dryer, Wi-Fi and flatscreen T.V's. Guest have access to all Pristine Bay Resort amenities including a 25,000 square feet Beach Club with pools, restaurants, two tennis courts, the Black Pearl Golf Course (the island’s only golf course – an 18-hole championship golf course designed by Pete Dye), fitness room and, private beach, Las Verandas Hotel and much more. Pristine Bay community offers the right setting feel to unwind, relax and enjoy the tranquil atmosphere with amazing surroundings that will make your stay enjoyable.